Mad Men is airing tonight with the show’s season finale and though the show ends in the 70’s it’s the 50’s Don Draper look that took style trends by storm bringing back retro looks that are still popular on the runways today. 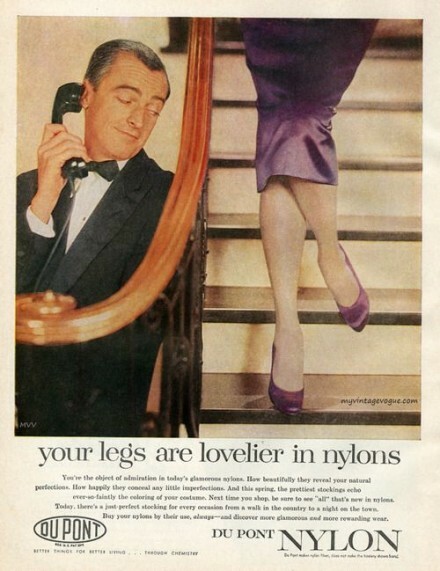 I’ve written several articles on the style of Mad Men and it still is having an impact in the fashion world. Who doesn’t love a sharp dressed man? 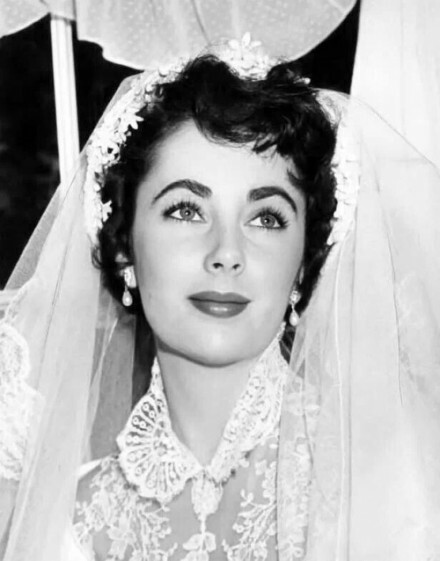 As a vintage fashion show producer, I’m grateful for the return of this style. Since I have the opportunity to talk to vintage dealers, and collectors alike, this look is easy to recreate and still looks classic and modern today. These vintage styles are affordable and still available at shows like the Alameda Point Vintage Fashion Faire where dealers bring the best selection of clothing and accessories to recreate the Don Draper style. Sloane Wilson’s 1950 novel The Man in the Gray Flannel Suit inspired American men to embrace a new stereotype: The corporate executive who plays by the rules and does not break out on his own. Conformity and rigid hierarchies were the marching orders of the day. As an effect of World War II, men favored conservative business suits due to the effect the war had on the masses. They liked a uniform as a sense of security that dressing the same gave them. 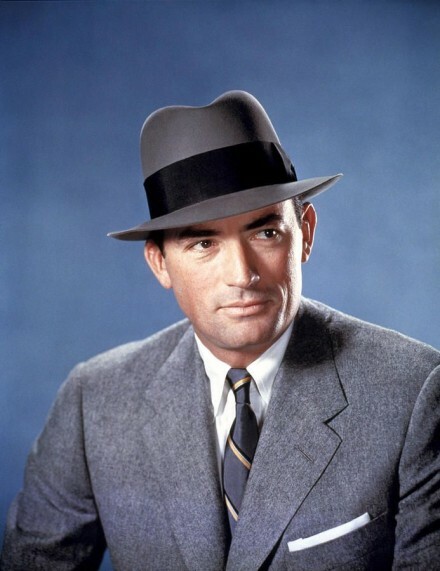 Conformism was so prominent that the “Man in the Gray Flannel Suit” became a known archetype; a three button single-breasted, charcoal gray flannel suit with narrow, small notched shoulders, flaps on the pockets and pleat-less tapering trousers. Underneath, a white or pale blue cotton broadcloth shirt with a button down collar and button cuffs. 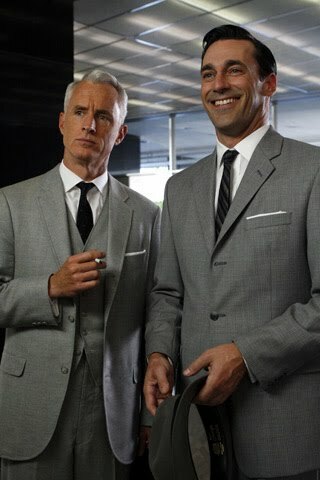 The men at Sterling/ Cooper favored the formal white shirt as the light blue shirt was considered more casual or “blue collar” so not appropriate for the corporate environment. The narrow hats were worn brim up or down and sometimes with a pinched crown. This style was popular before with Ivy Leaguers but by the mid-50’s the look was cropping up all over America, not only with the preppie set. 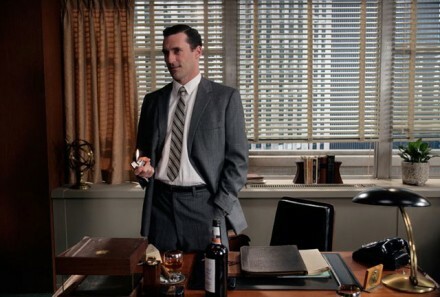 This style was prominent in the early seasons of Mad Men. So a key piece of this trend to be integrated into your current looks is the grey blazer, which has been featured heavily all over the runways (Ralph Lauren, Brooks Brothers, etc.) Grey is just as versatile as navy when anchoring against other neutrals or bold colors. In fact, the mid-grey blazer may be the most versatile of them all. Since we saw Don Draper “off duty” he’s also the best example of casual, non-business wear for men in the show, sporting outfits like plaid flannels and navy polo shirts as well as his classic office suits. Weekends or holiday attire allowed men to get relaxed and exhibit more character in their fashion choices. If men’s suits tended to be conservative in the 50’s, sports jackets and slacks had a jauntier air. Vintage clothing dealers sell items like these and it made a big comeback in the 80’s with New Wavers so there are more modern retro versions that are easy to find from the Reagan era. 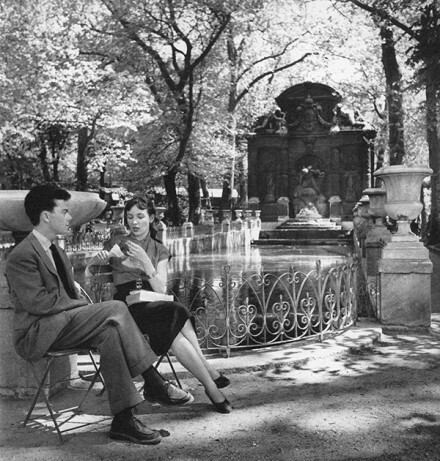 Leisure time in the 50’s was an opportunity for more self-expression in fashion. 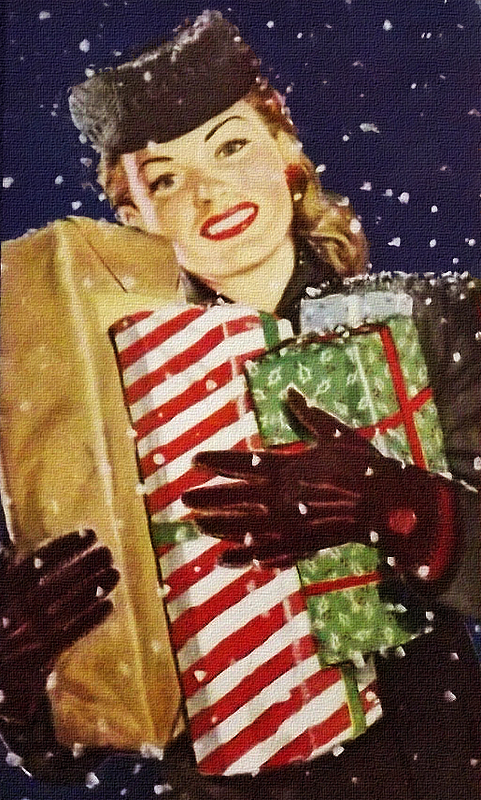 Although women spent money on clothes, men tended to spend money on houses and their growing families. Men simply had to buy for work but there was money to be spent for weekend and holiday clothing namely sportswear. Sports jackets-single breasted with a single vent- came in colorful madras plaids (The look of Palm Beach tycoons that filtered down to the masses) loud checks, smaller scaled houndstooth checks and windowpanes. 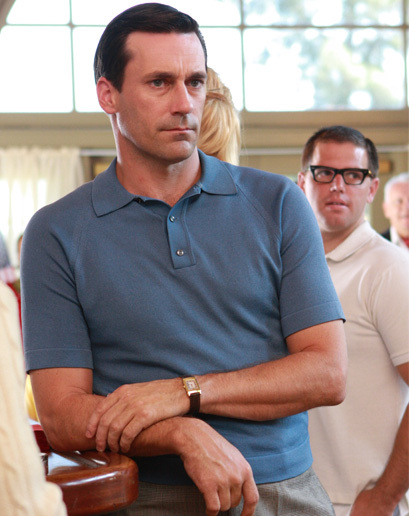 We saw Don Draper sporting these looks to perfection when on vacation with his family. What did 50’s men wear on vacation? Tiki or Hawaiian shirts with bright colors and intricate patterns are highly collectible and are still in fashion. Hawaiian shirts of the period boasted subtle, intriguing designs. The TV series Magic City gives a glimpse of the Miami sportswear set showcasing informal vacation wear: short sleeved, knitted t-shirts, gabardine or twill slacks. Bathing suit designs were in small plaids or stripes with coordinating shirts. The affluence of the 50’s meant increasing travel, (by car or airplane) so these sporty, lightweight duds were as likely to seen at a country club or a Miami Beach hotel pool. Don Draper sported these looks when he vacationed in California.